Oh, my god! We killed Kenny! 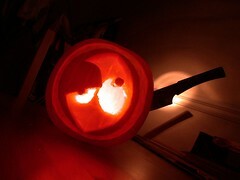 Me an' t'other created a tour de force jack o' lantern for Hallowe'en – my first effort, but surely t'will not be my last. Was an absolute scream though. There are some really impressive efforts at Extreme Pumpkins. I wanted to try the kerosene-soaked rag, for effect, but t'other wouldn't let me. What's with all the t'this and t'that? My God, you're not turning into a Yorkshireman are you? Oh, you know that deep down, deep deep down, I secretly yearn to be a Yorkshireman. But the surgery is expensive and I can't quite get the accent right.